Available November 1 at Noon CT through November 30 at 11:59 p.m. CT, or while supplies last. Did you know 1 in 30 American children will face homelessness sometime this year? Please join us in helping homeless children have sweeter dreams with our “’Twas the Night Before Christmas” look. This limited-time look is a beautiful way to spread holiday hope and nighttime essentials to children who lack a source of comfort and security during a very traumatic time in their lives. 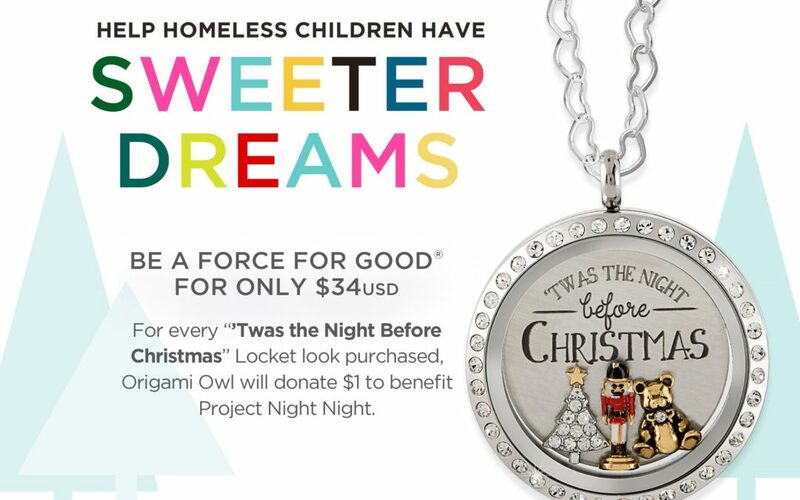 Origami Owl® will donate $1 from every “’Twas the Night Before Christmas” Locket look purchased, in the U.S. and Canada, to benefit Project Night Night, an organization that donates over 25,000 Night Night Packages each year to homeless children 12 and under. Each Night Night Package is in a new, canvas tote bag, and includes a new security blanket, an age-appropriate children’s book and a stuffed animal. Their goal is to deliver a Night Night Package to every homeless child in the country who needs one. Here are FAQs about our limited-time Force For Good looks. Have a cause that’s close to your heart in the month of November? Then take a look at our Cause Charms! During the month of November, we recognize there are many causes including Alzheimer’s Awareness, Pancreatic Cancer Awareness, Lung Cancer Awareness and Diabetes Awareness. Be sure to share our Cause Charms with your Customers, which are available all year long and always give back 100% of the profits to a charity/organization that supports the specific cause. You can find these Charms under Shop > What’s New > Force For Good. Don’t forget: If there’s a cause you’re passionate about, no matter what time of year it is, you can hold a Force For Good Fundraiser! You can find the Force For Good Fundraising Toolkit in your Back Office under Designer Resources > Force For Good. We have everything you need to hold a successful fundraiser including email templates, call scripts, a flyer and social assets. Thank you for joining us on our mission to be a Force For Good! We are so honored and humbled by the support you showed for our Las Vegas and Puerto Rico Force For Good initiatives. While we can never replace what was taken from this horrible tragedy and natural disaster, we are so grateful to everyone who shared the Las Vegas and Puerto Rico Charm with their friends, families and Customers. Because of you, we are able to give over $7,000 to support the victims and families affected by the Las Vegas tragedy, and over $2,900 to support those affected by Hurricanes Irma and Maria. In addition, thank you for all that you did to share our October Bullying Prevention Awareness Force For Good Locket look. We were able to give back over $3,600 to bullying prevention awareness.